In your face March! I managed to get this dress done and shot by the end of the month. This is yet an other design from the Stylish Dress Book by Yoshiko Tsukiori. 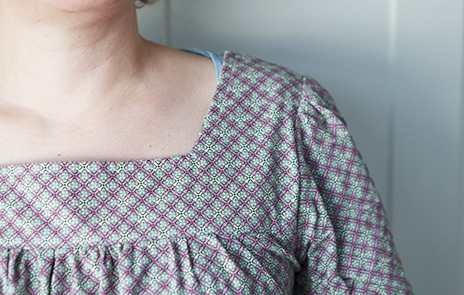 This pattern (reverse-yoke mini dress aka R – p. 23) calls for velvet and a bit of satin for the yoke. But I bumped into this amazing cord like fabric and didn’t even bother looking for anything close to satin for the trim detail. I found this dress far much easier to make than the January one. The yoke is pretty straight forward as it is made of straight lines. Assembling is easy too, the only potentially tricky bit being the gathers at yoke and sleeves but I had some practice with the previous dress so it was ok. This fabric, some cotton and synthetic mix, is a pure joy to work. It is easy to iron, cut and saw. It is from the medium weight family so it has more body than your usual quilting cotton. There are creases on the picture but they disappear as soon as they arrived. And the colours! Once again I managed to get out of my black-blue-brown comfort zone. The pattern is sage and lilac with some dark grey outlines, which kind of springy isn’t it? Now what is up for April? 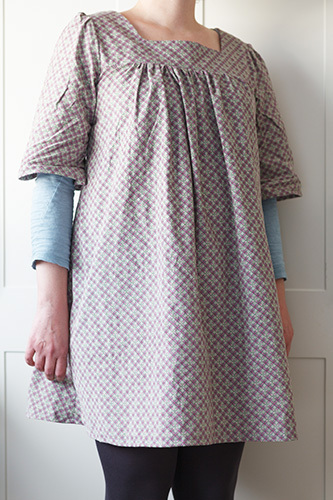 I think I made enough empire waist dresses, I want to go for some gather free A-line dress. I am still looking for the perfect pattern, I keep you posted.